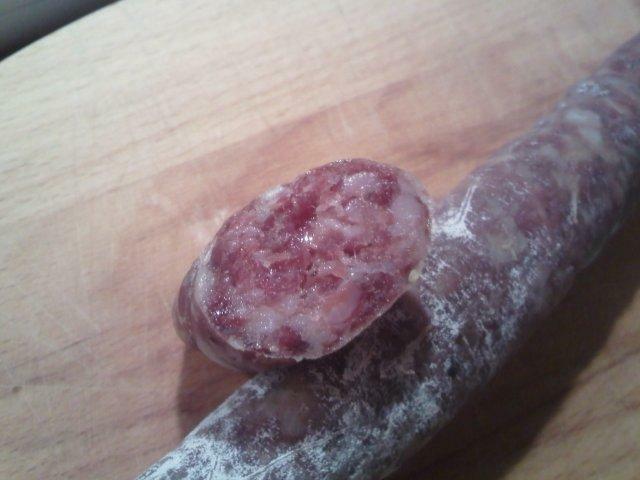 This is my second salami and it has gone rather well. 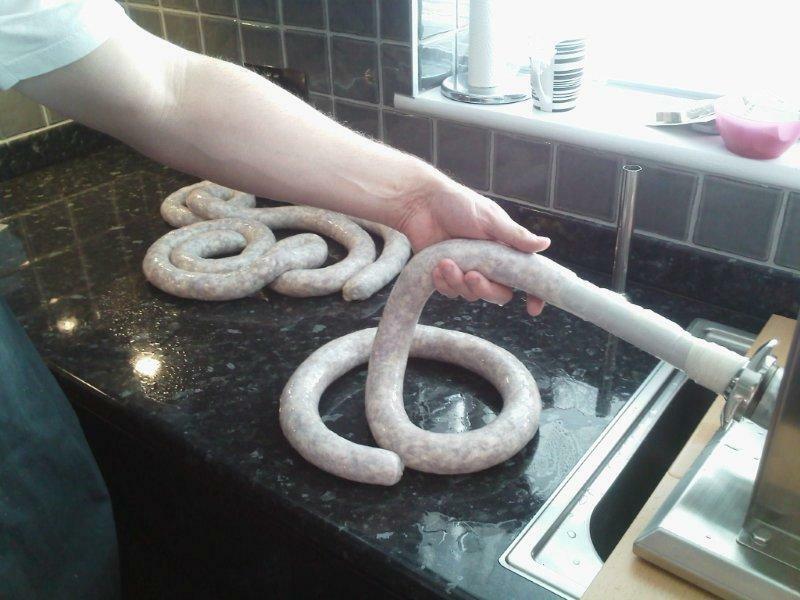 It is Italian based from a guy called “Spuddy” on http://forum.sausagemaking.org. It is quite basic and seems to work fine with naturel starter. Day 2 – Next morning checked and range of conditions was 18-25C 30-47RH. It got warmer! At this point take a small camembert slice with god white mold. Scrape off outer mold and place in tepid boiled cooled water in mug with some sugar. Leave for a couple of hours to multiply. Strain solution and paint onto salami to promote white mould growth. Day 3 – Hung in garage attached to house. The salami go in an old fridge (turned off) with door cracked open about 3cm. Conditions are 14.7-11C 71-43% RH. Also a bowl of water is placed at bottom of fridge which has a load of salt in it. This prevents it going bad and raises the RH. Wash your hands and then inspect daily at first give them a bit of a squeeze to promote moisture distribution. Push the horseshoe salami outwards to expose the crevice that forms. This prevents this staying wet and going blue moldy! If you see any blue mold form, take out all the salami clean down fridge with bleach or similar cleaner I use flash wipes (make sure smell goes before putting back). Then wipe salami with vinegar (which stinks) and put back. This seems to work! But will kill the white mold too. In the end it took only 19 days to finish, then I vacuum packed it and fridged it. Seems best to peel skin before slicing and the skins come off really well as vacuum packing makes them a bit more moist. In terms of flavour you certainly can taste the garlic but it is nice and not too strong. Also might be nice with some chili as well. Fennel simply goes into background which is interesting.